Trivia: At the time of filming, Jack Nicholson had just embarked on his longstanding relationship with Anjelica Huston. This made his scenes with her father, John Huston, rather uncomfortable, especially as the only time Anjelica was on set was the day they were filming the scene where Noah Cross interrogates Nicholson's character with "Mr Gittes...do you sleep with my daughter?" Roman Polanski's classic neo-noir thriller, set in 1930s Los Angeles, stars Jack Nicholson as Jake Gittes, a private detective who specializes in domestic cases (meaning he follows cheating spouses and catches them in the act). One day, he’s visited by Evelyn Mulwray, the wife of Hollis Mulwray (Darrell Zwerling), the Chief Engineer of the city’s Water Commission (Los Angeles has been experiencing a drought for some time, due in part to decisions Mulwray made, so almost everyone knows his name). Believing her husband is having an affair, she hires Jake and, sure enough, he soon photographs Mulwray in the company of another woman. But when the story hits the front page of every newspaper in town, a second Evelyn Mulwray (Faye Dunaway) shows up at Jake’s office, saying she never asked him to spy on her husband, and threatening legal action against him. Realizing he was set up, Jake launches his own investigation into the matter, and, along the way, learns a thing or two about the city's water supply. Events take an even stranger turn when Mulwray is found dead, leading Jake to question a number of unsavory characters, including the wealthy Noah Cross (John Huston), who was one of the last people to see Mulwray alive. Yet all this is just the beginning, because when Jake Gittes finally gets to the bottom of this bizarre case, he's gonna find one hell of a scandal waiting there for him. 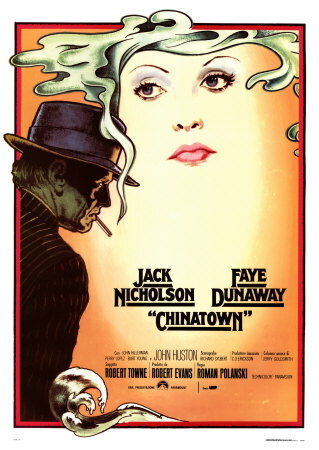 Chinatown is a throwback to the films of the ‘40s, with Nicholson and Dunaway standing in for the likes of Bogart and Bacall, only with a twist. Starting out as your typical private investigator, a guy who never gets rattled, Nicholson’s Jake soon realizes he’s going up against forces that are beyond his comprehension. At one point, while out looking for answers, he’s even threatened by a knife-wielding thug (played by director Polanski) who slices Jake’s nose, warning him he’d better back off. As his investigation goes deeper, the cynical detachment Jake exhibited early on slowly fades away, and is replaced by a genuine feeling of dread that grows stronger with each new revelation. Accustomed to being in control, Jake Gittes suddenly finds himself a pawn in a much bigger game, one he has little hope of understanding, let alone winning. As for Dunaway’s Evelyn, she’s a lot like the noir heroines of old, a la Mary Astor in The Maltese Falcon, in that she’s clearly hiding something from Jake, only in her case, what she’s holding back is of a very personal nature. In the end, most of Jake’s questions will be answered, though the solutions will rattle him even more than the mystery did. A dark, disturbing tale of corruption and greed, Chinatown is, in many respects, the blackest film noir you’re likely to ever see. The more time passes, the more I like this film. it's not only one of the darkest film noir, but I think it is one of the very best. 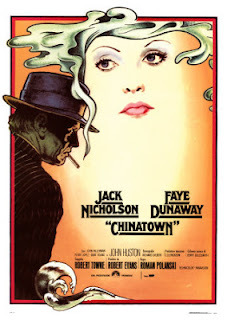 Chinatown is a great movie and yes, a very dark noir. Great review. It's my all-time favorite movie. You did a great review of it.